Planned gifts are essential to the longevity of the Buffalo Bill Center of the West and its mission of preserving and interpreting the natural and cultural history of the American West. The support and generosity of our constituents fosters the legacy of the American West here at the Center. Our goal is to provide the best benefit for both you and the Buffalo Bill Center of the West. For information on Planned Giving, please contact the Development Office at 307-578-4008 or [email protected]. If you have an object that you would like to donate, we would be happy to assist you with that as well. His Serene Highness Prince Albert II of Monaco’s legacy here goes back to a visit his great great grandfather made to Cody and the surrounding area in 1913. Prince Albert I hunted with William F. Cody on that trip, and the current prince returned to commemorate the event in September 2013, awarding a major research grant. 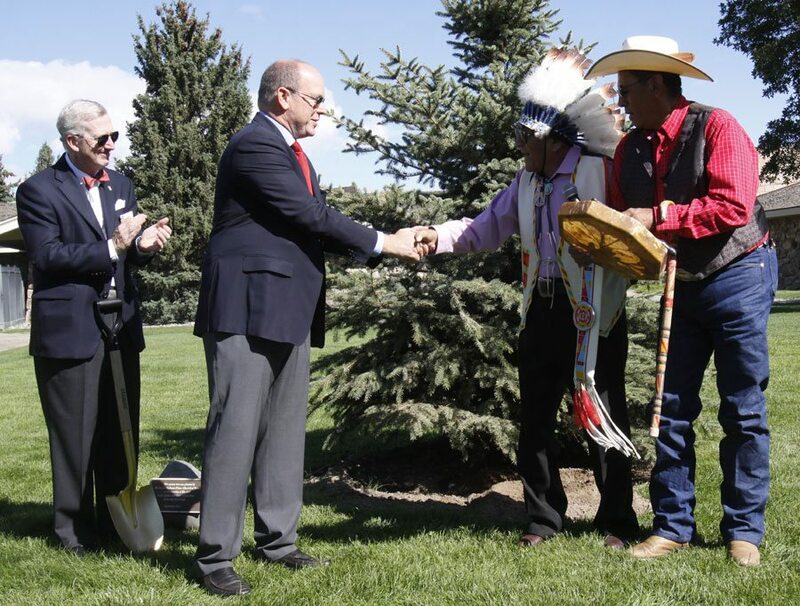 Here he continues the family legacy by planting a tree, and shakes hands with Crow tribal elder Joe Medicine Crow, who sang an honor song for the occasion. Questions, comments, or concerns about Development and Membership?